Just three weeks after President Wilson declared war on Germany, AU’s board of trustees offered the campus for any purpose the government could see fit. 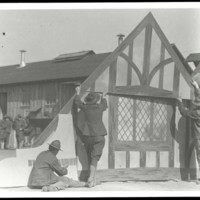 1,000 soldiers were trained in new camouflage techniques at AU, including these men who are constructing a mock house to be used to shield equipment from enemy surveillance. 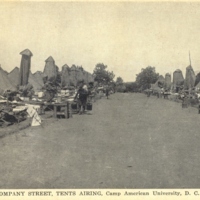 While assigned to Camp AU, many soldiers lived at the camp while others opted for allowances to rent apartments downtown. The camp offered sports fields and free French lessons in addition to usual army camp facilities. 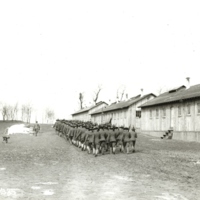 Thousands of army personnel were stationed at Camp AU between 1917 and 1919. 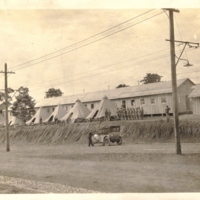 The once empty campus was filled with temporary barracks and tents to accommodate the soldiers. 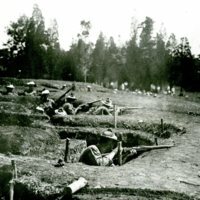 The 30th Engineers, such as these men receiving training in trench warfare, had their headquarters at the AU campus during the war. In 1917 American University (AU) offered the government use of the still unfinished campus for army training. At the time, only the College of History (Hurst Hall) and McKinley Building had been built, both of which were used by the army during the war years. 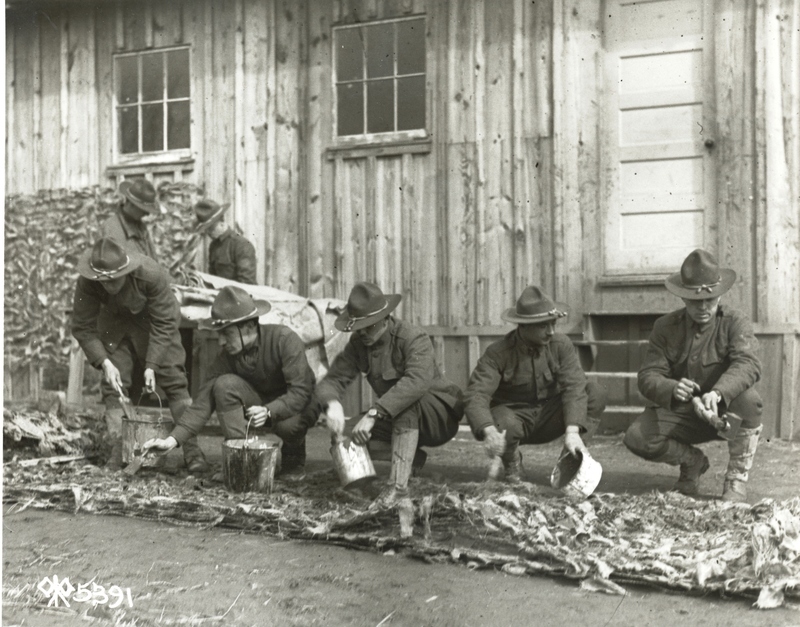 The government established two separate camps, Camp American University and Camp Leach. The campus was mainly utilized by the Engineer Officers’ Reserve Corps, who established a training camp on the university grounds. In addition, the campus was home to camouflagers, foresters, and the science laboratories of the Bureau of Mines. Mary Graydon Center (the Pennsylvania Building) was begun during this time by the U.S. government and intended to be used as science laboratories, but the war ended before construction was completed.